^ 王幼平. 《旧石器时代考古》. 中国北京: 文物出版社. 2000年11月. ISBN 7-5010-1218-0 （中文（中国大陆）‎）. ^ 旧石器时代早期考古学文化（中更新世时期）. 中国考古网. 2010-06-29 [2017-04-18]. ^ 陈道林. “建始直立人”， 挑战人类祖先最早起源于非洲的学说. 中国日报湖北站. 2011-03-06 [2017-04-14]. ^ 龙骨坡遗址第四次发掘工作启动. 科学时报. 2011-11-18 [2011-11-18]. ^ 刘东生、丁梦林，《人类学学报》1983年第1期，第40-48页；Geoffrey G. Pope, Proc. Nat. Acad. Sci. 80(1983), 4988-4992. ^ 谢飞. 泥河湾--东方人类从这里走来. 中国互联网新闻中心. 河北日报. 2006-09-22 [2017-04-11]. ^ 戴劲松、房宁. 考古专家将在年内复原“郧县人”头骨化石. 新华网 （中文（中国大陆）‎）. ^ 石苑. 图文：专家参观“郧县人”头骨化石遗址. 新浪网 （中文（中国大陆）‎）. ^ 王兵、宋克顺. 近百万年前“郧县人”有了名字. 新浪网 （中文（中国大陆）‎）. ^ 广西百色盆地旧石器时代考古发掘取得重大突破. 中国文保网. 中国文物报. [2017-04-18]. ^ 60万年前的大岭上：甘肃最早的旧石器时代早期人类遗址. 新华网. 圣地泾川. 2012-05-22 [2017-04-18]. （原始内容存档于2013-06-19）. ^ Ian Tattersall. Out of Africa again...and again?. Scientific American: 60–68. ^ Shen, G; Gao, X; Gao, B; Granger, De. Age of Zhoukoudian Homo erectus determined with (26)Al/(10)Be burial dating. Nature. 2009年3月, 458 (7235): 198–200. Bibcode:2009Natur.458..198S. ISSN 0028-0836. PMID 19279636. doi:10.1038/nature07741. ^ 魏海波. 辽宁庙后山遗址研究的新进展 (PDF). 人类学学报. 2009-05, 28 (2): 154–161 [2017-04-14]. ^ Wenzhong Pei, Rukang Wu, Lanpo Jia, Mingzhen Zhou, Xianting Liu and Zeyi Wang (1958). Report on the Excavation of Palaeolithic Sites at Tingtsun, Hsiangfenhsien, Shansi Province, China. Memoirs of the Institute of Vertebrate Palaeontology and Palaeoanthropology A2: 1-111. ^ Xinzhi Wu and Maolin Wu (1985). 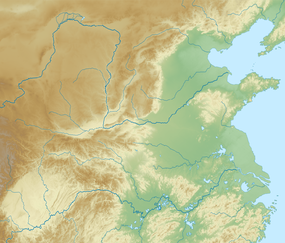 Early Homo sapiens in China. In Palaeoanthropology and Palaeolithic Archaeology in the People’s Republic of China, ed. R. Wu and J. W. Olsen. New York: Academic Press, 91-106. ^ 周国兴. 中国广西柳州白莲洞石器时代洞穴遗址——对华南地区旧石器时代晚期文化向新石器时代早期文化过渡的探索[J]. 东南文化, 1986, 2: 003.